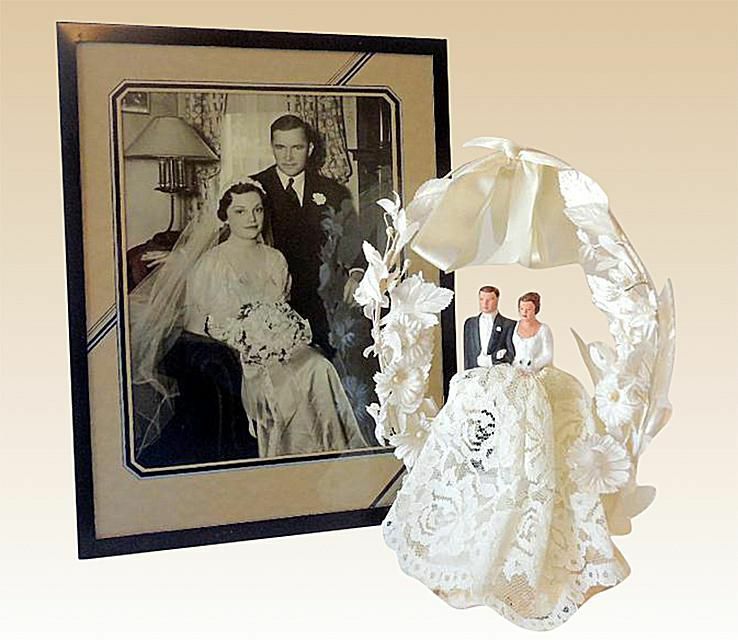 Many wedding memorabilia fans get their start picking up a cake topper or two. These range in value from $5-10 for common examples to hundreds for unusual antique versions. Among those at the higher end of the spectrum are adorable bisque porcelain cuties from the 1920s resembling miniature bride and groom Kewpie dolls that sell for $100 or more in the original box. Earlier examples from the Victorian era may not feature a bride and groom, but rather an angelic porcelain figurine surrounded by wedding symbols or an elaborate basket of flowers fashioned of wax. Most wedding toppers aren't quite as unique or highly priced though. In fact, many of the plastic pieces produced during the '40s and '50s look very much alike with brides wearing generic white dresses and grooms dressed in black tuxedos. All this repetition leads collectors to hunt down unusual versions such as those featuring bridal gowns of varying colors and grooms in military duds. Other toppers popular with collectors exhibit a personal touch. Whether they're adorned with a lace canopy or elaborately decorated with flowers and bells, an ordinary figurine transformed into a clever keepsake stands out among the ordinary. Keep in mind that there are relatively few reproductions of wedding memorabilia on the secondary market, but some newer vintage style cake toppers can be confusing to accurately date. While cake toppers have certainly come into their own with collectors during the past few years, adding other related wedding items to a collection can make it complete. Bridal and wedding party photos, for instance, offer an affordable glimpse at the past. It's not uncommon to find black and white photographs dating back to the early 1900s offered for sale in antique shops for $3-10 and many of these take on wedding party themes. If you'd prefer to collect family wedding photos, now might be the time to ask a mother, grandmother or great-grandmother to share some of the encapsulated memories they've got tucked away in a family photo album. There's a good chance they'll be delighted to accommodate you and thrilled to see that you're preserving memories by incorporating their marriage keepsakes into a clever display. Vintage postcards featuring wedding themes aren't as common as other types of cards, but very attractive examples can be found for $25 or less if you search online. These also enhance a collection of wedding memorabilia when tucked among cake toppers and other more dimensional items. While you're at it, why not add a doll or two dressed in wedding attire to the ensemble? From vintage Barbie and Ken dolls dressed in vintage regalia to Madame Alexander's vast collection of cute-as-can-be brides, there's a wedding doll on the secondary market to suit every budget and taste. Most wedding collectibles avidly sought today date to the early to mid-20th century. Items from the second half of the 19th century also hold appeal, but are markedly harder to find these days. If you’ve got deep pockets, adding a French globe de mariee, or marriage globe, to your collection can add a touch of antique elegance. Marriage globes were popular keepsakes c. 1900. Under a glass dome, a bride’s wedding coronet, flowers, and other family mementos were artfully arranged. These beautiful collectibles sell easily for $500-1,000 these days when you can find them complete with the glass in place. Of course, collectors with a penchant for the unusual will also consider wedding cups to round out a collection. Some of the most popular wedding cups are styled in the European fashion where both the bride and groom toast from the same vessel. These attractive metal goblets are often shaped like a bride with her flowing dress forming the larger of the two cups to hold the groom's drink. Over her head she holds a smaller cup for the bride’s sip of beverage. Although most wedding collectibles don't have the deep connotation of the wedding cup, every vintage remembrance of a couple's exchange of vows is rich with nostalgia. What was once a part of a bride's perfect day can now serve as the perfect find for a sentimental collector.